Los Gatos, CA, November 04, 2010 --(PR.com)-- Happy About Publishing today announced the availability of a new book called the "42 Rules of Product Management." "42 Rules of Product Management" is a collection of rules, tips and strategies for becoming more effective as a product manager. Written by a group of experts with over 500 years of product management experience, the book is designed to be an easy read that imparts immediately useful information to the reader. 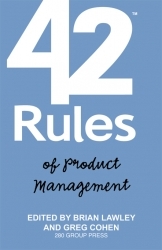 "42 Rules of Product Management is the only book of its kind for Product Managers…" said Brian Lawley, the author, "…it helps them avoid mistakes, increase success and move their product management careers forward." "We are proud to have Brian and his colleagues join the 42 Rules book series," said Mitchell Levy, publisher. "The ideas and concepts are presented in a way that makes them actionable. It's what every product manager needs." The book is available as a paperback, ebook format and on the Amazon Kindle. The paperback is priced at $19.95 and the ebook is $11.95. The book is available through Happy About publishing and also through Amazon.com and other book sellers.